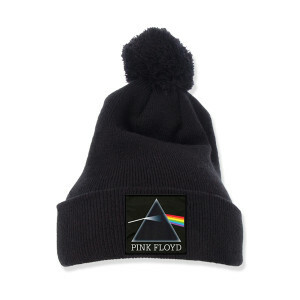 This high quality knit cap is embroidered with detail created for the Official store - black square emblem with the Pink Floyd prism logo inside, on a black pom-pom beanie. I bought the Pink Floyd beanie for my husband as a Christmas gift. The quality seems good. My husband is pleased with his gift. I was impressed with smoothness of the whole process. I received updates on the progress of shipping and an exact date when the gift would arrive. It arrived exactly when I was informed that it would. I expect to be buying more gifts in the future.